Like the rest of us motorheads, the moment you see a bunch of new, shiny tools at the auto parts store or home improvement center, you start to salivate. Talk about a "Pavlovian response!" We're not going to talk about a "cure," since there's nothing wrong with us. 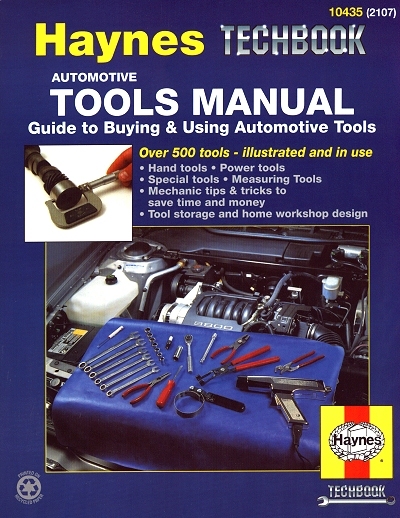 But we will talk about the Haynes Automotive Tools Manual. This guide is packed with more than 500 clear pics of hand tools, power tools, special tools, and measuring tools. But, in addition to all that, it also includes sections covering mechanic tips and tricks, tool storage and how to design your home workshop. So, if you are serious about being the best do-it-yourself mechanic you can be, this book is for you! There are many tools in this category you'll never know you're going to need until the car breaks down and you're faced with a repair you've never done before or you don't have the tool(s) for. Let's say your power steering pump is leaking fluid. Removing the pump from the engine is no problem. You have all the necessary sockets and wrenches, but, lo-and-behold, before you can get to the bolts you have to remove the pulley, and that requires a special puller (see illustration)! buy the tool and repair it yourself (check with your neighbor first, maybe he has the tool and you can borrow it). Buying the tool is the least expensive of the options that example, and you'll have the tool if it's needed again. Depending on your skill level and your frequency of tinkering, there are other special tools you'll use more often. If you do a lot of engine work, you'll need many of the special engine rebuilding tools shown in Chapter 7. For general repair work you could probably use a seal remover and a seal driver (see illustrations) which can be used on any type of engine or transmission. If you drive cars with manual transmissions, the need for a clutch alignment tool will be inevitable (see illustrations). Many times, especially on newer automobiles, it's next to impossible to reach an engine sensor with normal hand tools. Therefore, there's a multitude of special wrenches and sockets available that make removing vacuum switches, oil pressure senders and emission control sensors possible without damaging the sensitive electrical units (see illustrations). Modern fuel-injected vehicles are often equipped with spring-lock couplings on fuel lines. If it becomes necessary to remove a fuel line from the fuel rail, or in some cases just to replace the fuel filter, you will need the special spring-lock coupling removal tool that fits your specific fuel-injection system (see illustration). Don't even think about removing these special couplings without the proper tools. An attempt to do so could cause serious damage to the fuel line and create, of course, an unneeded expense. You will need at least two sets of snap-ring pliers. I know, I've already stated in Chapter 2 that pliers are basic hand tools, but these pliers are special. They serve one function, and that is to remove snap-rings. Actually, one of the sets are lock-ring pliers (see illustration). Large, stiff lock-rings are used to hold a component on a splined shaft, and these pliers with their outer gripping jaws are used to expand the ring (see illustration). You may also encounter either internal or external snap-rings and one set of reversible snap-ring pliers is all that's necessary for both (see illustration). Ask a question about Automotive Tools Manual.